I love, love…just look at the way they look at each other. April 11th, 2015 was the happiest day of my friend’s life and I honestly would not have missed this for the world. Kim Seon Hwa has been such a blessing to my Korean experience and she deserved this day and many more blessings to come her way. Ameen. I remember the day she told me she got engaged and I legit screamed (am extra lol). I was so beyond happy for her. I can proudly say she is my closest Korean friend and I would not have it any other way. We are 2 different people and I am very loud and well lol anyone who knows me would know, but she is the exact opposite of me, but boy our friendship works and you know what they say opposites attract. This moment I will cherish forever. My friend took me out for lunch and we had a girls day. I brought out my wallet to pay and she said no in Korean culture the person who invites you to the wedding takes you out and pays for your meal. I was blown away. 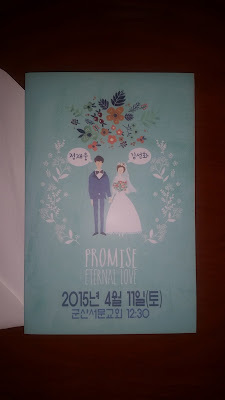 This is not only true for Korean wedding customs but in their daily gatherings or outings. When I go out with my co-teachers and other colleagues they always pay for our dinner or lunch. I have now adopted and got myself accustomed to those customs and when you think about it, it makes so much sense, at least to me anyways. Me and my friend did a 5 day countdown to her wedding. She was under a lot of pressure and stress with wedding dress shopping, finding venue (church), food plans and funding, because as we all know no matter what culture you are from, weddings ain’t cheap. She was so happy when it was all over and done because she said the preparation and the stress she was under was not easy at all. 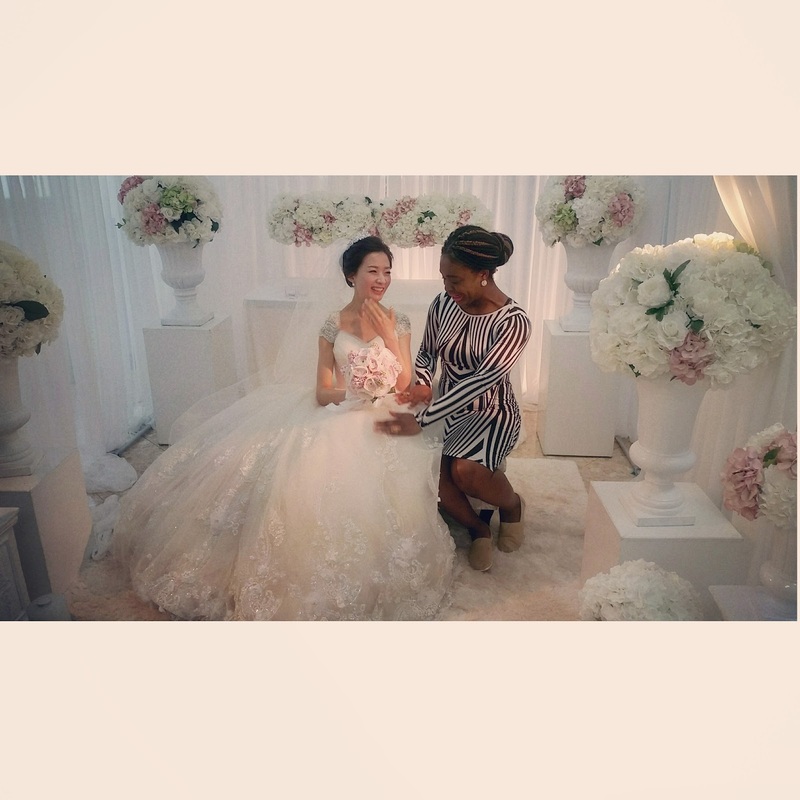 The day she sent me her wedding dress from her fitting I was honestly blown away, I had no words. 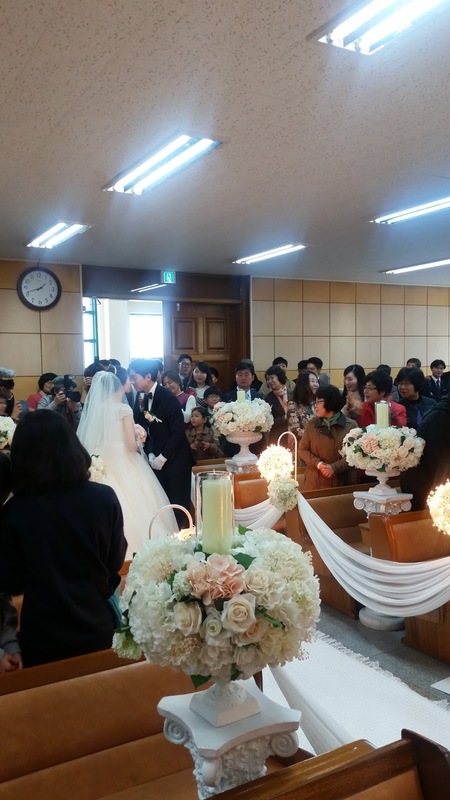 Koreans usually get married at a wedding hall, church or a catholic church. Rich people get married in a hotel and according to my friend hotel food is more expensive and they spend a lot more on their wedding. My friend had a wedding photo shoot which lasted 2 days and she looked breathtaking. One photo shoot was in Autumn and the other one was in in the winter. I have never been to a North American wedding. Sad right? Both of my friends that got married, I missed their wedding because I was here. My departure date could not be pushed forward and sadly I had a tough decision to make and I decided to leave and miss out on their big day. I was a part of the bridal shower and Bachelorette party though for one of the bride, which was TURNT (it was fun lol). According to my knowledge white dresses for weddings was created in North America. 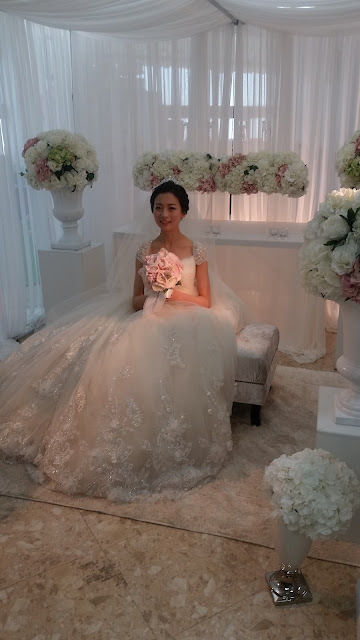 The women wore a white wedding dress to show purity(virgin). The power of Western culture influence has made lots of countries around the world adopt this to be the norm for their weddings, but I do believe just in like in my friend’s wedding an outfit change to their traditional clothing does happen. They had 2 performances from what I believe to be my friend’s students who danced to 2 K-pop songs. There was a piano session, which was beautiful and her hubby to be sang 2 songs to her. He did such an amazing job that I actually cried…..like real tears. The groom prepares a song for his bride and sings it on their wedding day. My friend’s hubby prepared a song for her and it was honestly beautiful, I cried. Like it was the way he looked into her eyes and sigh…..I am a hopeless romantic so this just stole my heart. This is a personal choice though that the groom makes, so it is not a must. After the ceremony followed the Pebek tradition and ceremony. Pebek is the part where they wore their traditional clothing called Hanbok. 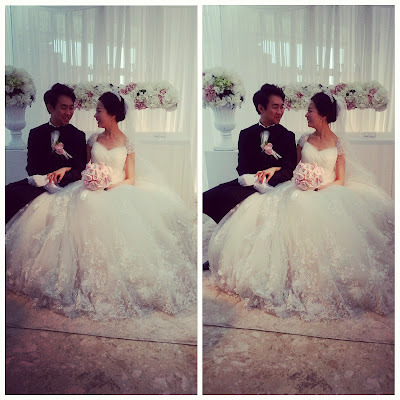 Both the bride and groom bowing to each other’s families was also part of this. She bowed to his parents and his relatives and he bowed to her parents and relatives. They also get money from parents and relatives after bowing. 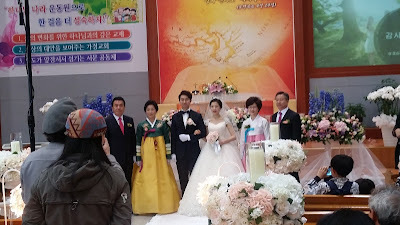 They also came around in their Hanbok when the guests were having lunch to greet us and to make sure all was well. The last ceremony of this part was where her and her husband had a what I thought was a tea ceremony was actually alcohol they gave to each other to drink. 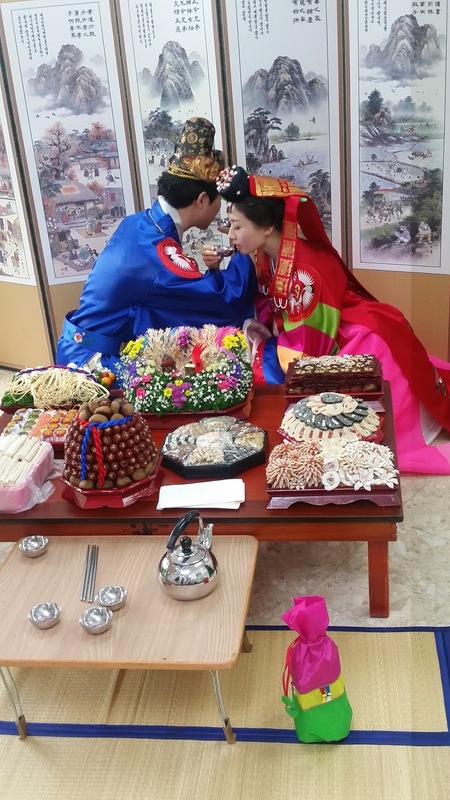 To bring good luck, the couple fed each other a date-like fruit. This is a ritual they practice for financial growth in their marriage. My friend said back in her parents generation they had an after party, but now they usually don’t have it because she believes in the new generation they want to get things over and done with…..”I think Koreans getting more fast fast.” She said these days people want to have a small wedding and a more meaningful wedding, but she did say that not all people do it like that, but she was speaking on her experience and others around her. 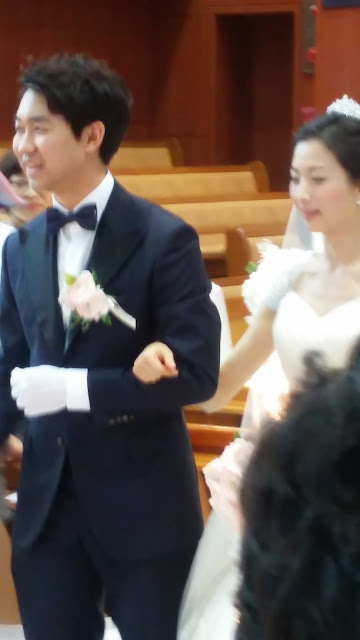 Her wedding was a common Korean wedding. They use to have a bachelorette and bachelor party, but now they usually don’t do it. Before the wedding the bride’s parents use to send gifts to the groom’s family. It was originally dishes, blankets, and silver spoon sets for the parents, and the grooms relatives sent Hanbok and blankets. These days instead of all the above, they now send money, which according to my friend could be a a major problem, which results in a few couples breaking up. I can see why money can be a sensitive issue. The groom’s parents use to send gifts to the bride’s house and the groom’s friends would help him, but that is no longer practiced anymore. They would carry the gifts and they wore the squid face mask (Hamjinabi 함진아비). 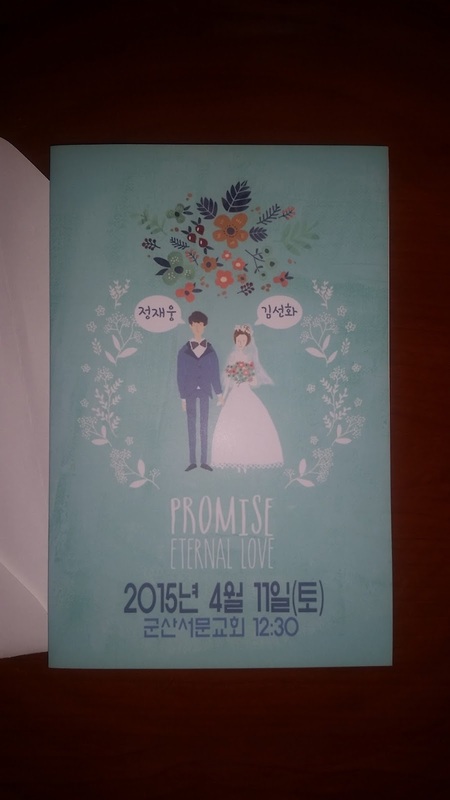 The bride’s parents gave money to the groom’s friends. My friend said she believes one of the main reasons this has died out because Korean usually now live in apartments and don’t know their neighbours anymore, so this practice would have been extremely difficult to carry on. A long time ago, all the neighbours use to celebrate the wedding of whomever was getting married. I actually wish this was still a part of Korean wedding traditional practices because it looks cool. Before the groom and his friends would enter the house, they had to step on a wooden ladle to scare the ghosts away and to wish the bride and groom first child to be a boy. I swear almost every culture wishes for their first child to be a boy, like seriously GIRLS ROCK HELLO…. 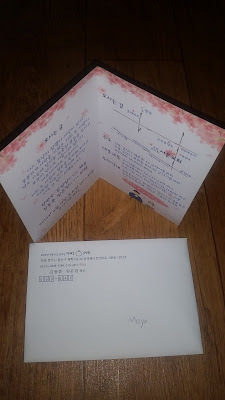 My friend believes that the old customs were better that have now died out and in her teaching me about Korean wedding traditions, I agreed with her. Korean traditional wedding food is noodles, but now they have buffet at their weddings and according to my friend food varies based on the company the wedding couple decides to hire. Her wedding was a buffet and it was beautifully set up. They had a variety of foods like: salad, a lot of meat (mostly pork lol), bread, pasta, noodles and many more dishes. MY FAVOURITE PART WAS INSIDE THE FOOD PLACE, THEY HAD A KOREAN BBQ SECTION AND THANK GOD IT WAS BEEF….IT WAS SIMPLY MOUTH WATERING…..
My friend and her hubby went to Hawaii for their honeymoon. My friend told me that usually people go on their honeymoon the next day after the wedding. For North America I honestly do not know when people go on their honey moon, but I would assume it would be right after the wedding or at least a couple days after. AND THEY LIVED HAPPILY EVER AFTER!!!!!! If you have any questions about this post or anything pertaining to living abroad, teaching abroad or anything else, please always feel free to e-mail me at semeerah_a@hotmail.com. I will be sure to get back to you, ALWAYS. God bless you all always and forever.